Helps all fowl in times of stress due to illness. Aids in stimulation of appetite for proper growth. Oxygenates blood and increases alertness. Excellent method of providing B-12 without the hassles of injection, very palatable base. 16 oz. 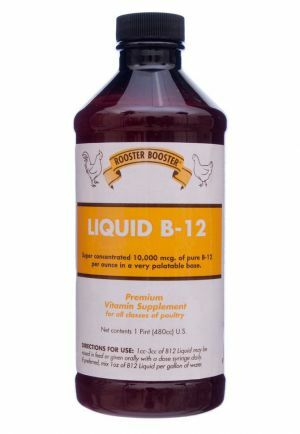 Rooster Booster Liquid B-12 Ingredients: water vitamin B-12 sodium benzoate potassium sorbate sodium saccharin xanthan gum artificial flavoring and coloring Shake well before using. Directions: 1 cc - 3 cc of B-12 liquid may be mixed in feed or administered orally with a dose syringe daily. If preferred, mix 1 oz of B-12 liquid per gallon of water.